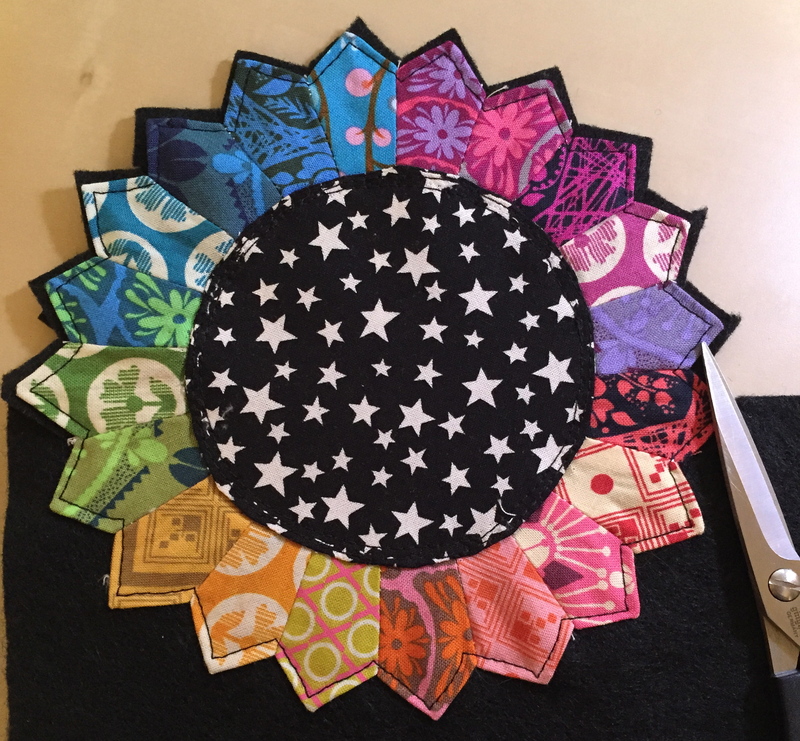 I had a lot of fun making mini dresden color wheels this past week, so I wanted to share a quick tutorial on how to make your own. 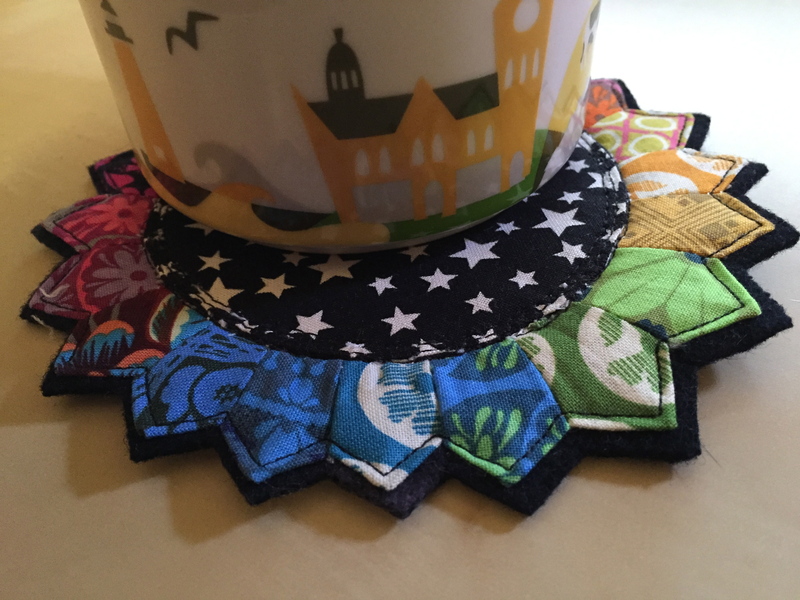 I backed this one with felt to use as a mug rug, which really brightens up my work space and makes me happy! After choosing fabrics from your stash, cut about 20-21 wedges (I used 20 wedges in the sample above and 21 in the sample below – use your own judgment to see what you can make work), using one of the smaller measurements on the Easy Dresden Template designed by Darlene Zimmerman (got mine from Joann’s). For the examples pictured here, I used the 1-1/2″ and the 2″ positions to cut my 20 wedges. 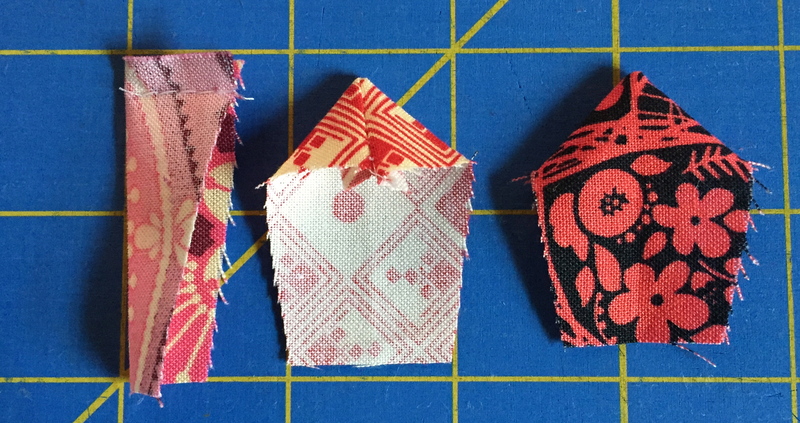 Fold each wedge in half the long way and stitch along the top, using a 1/4″ seam allowance. Turn right side out to form a point at the top. 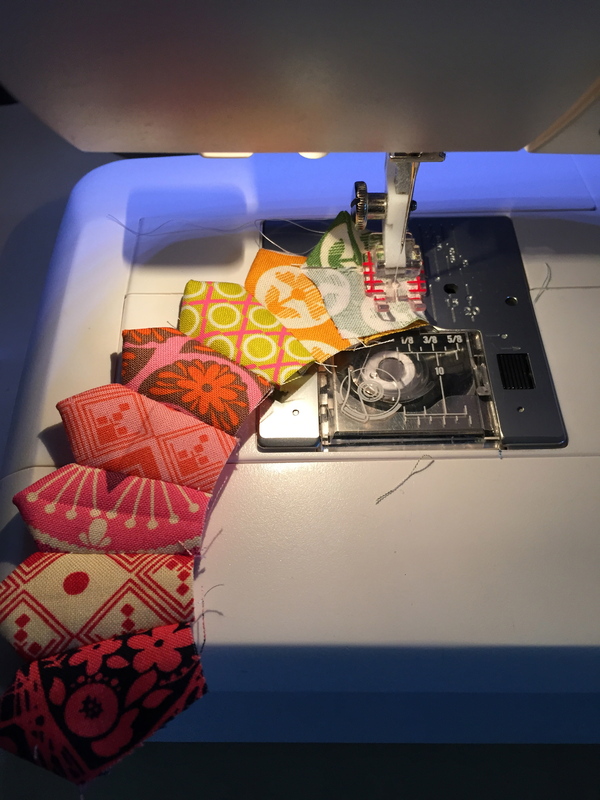 This is a great step to chain-stitch the pieces together. Lay each wedge right side together, and stitch all the wedges together to form a ring, using a 1/4″ seam allowance. Press seams open. 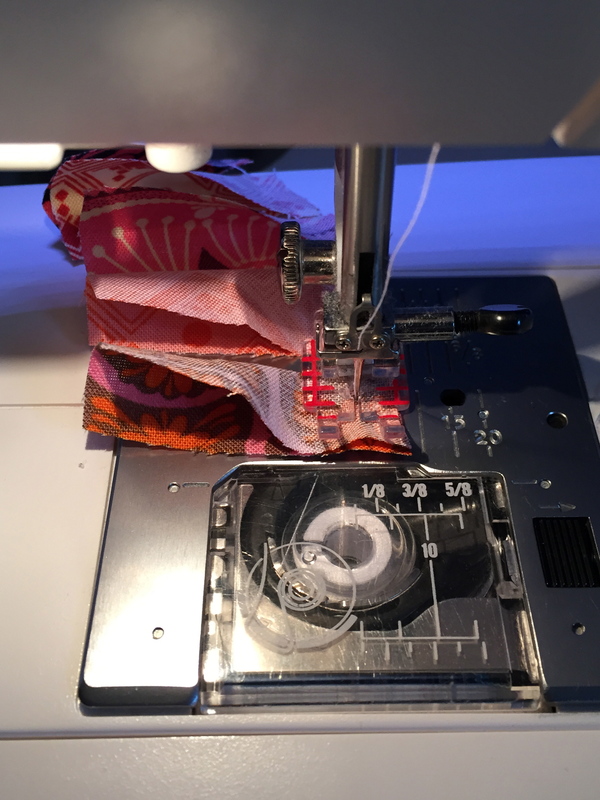 Measure the inner circle and add 1/2″ to 3/4″ to each side for the seam allowance. 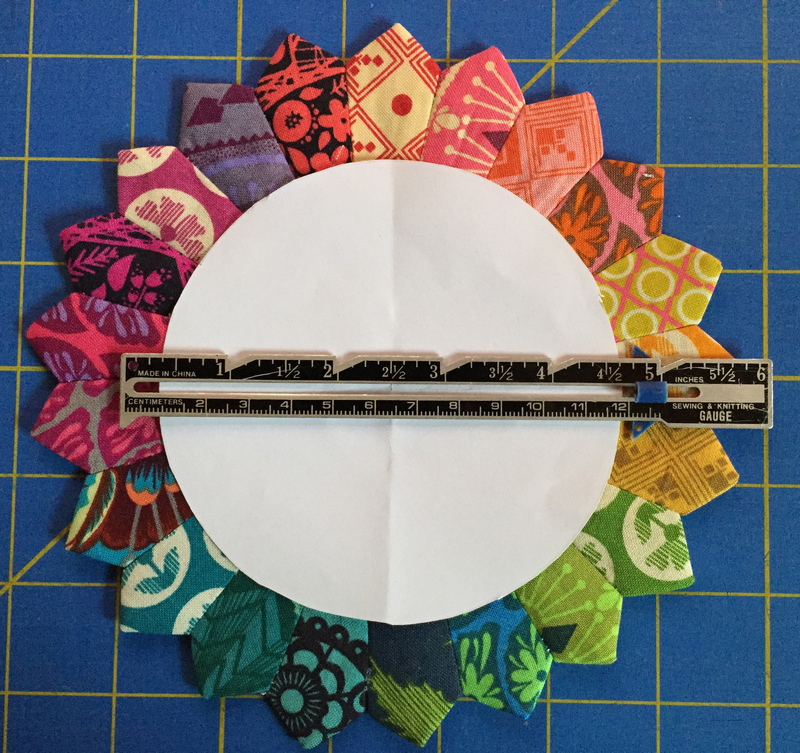 Cut a circle from paper or plastic to use as a template; cut 2 circles from your center fabric. 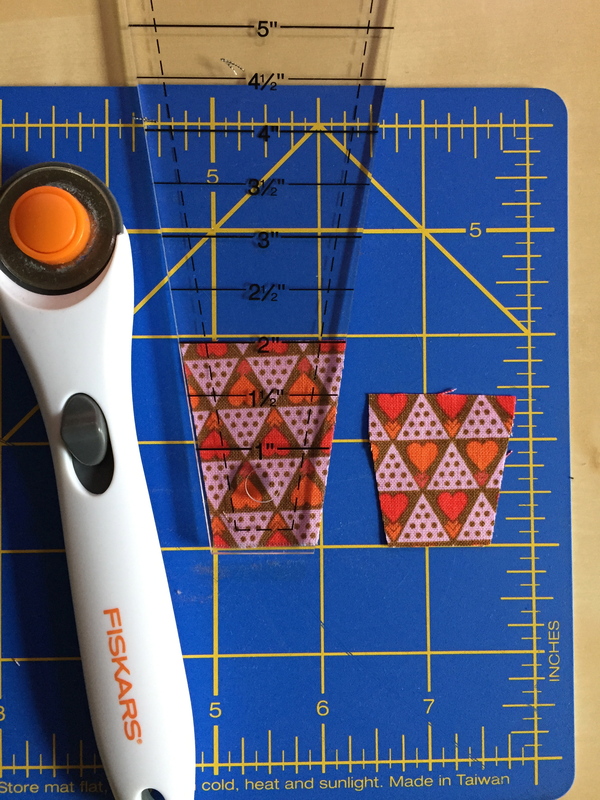 For these smaller dresdens, I cut circles that measured 4″ to 4-3/8″. With right sides together, stitch the two circles together using a 1/4″ seam allowance. Cut notches in the seam allowance to reduce bulk. Pinch the fabric on one side of the circle and cut a small slit. Pull the fabrics through that slit to turn the circles right side out. Press. Lay the fabric circles on top of dresden ring, pin if necessary, and top-stitch to attach to ring of the wedges. I top-stitched twice to make sure it was secure. 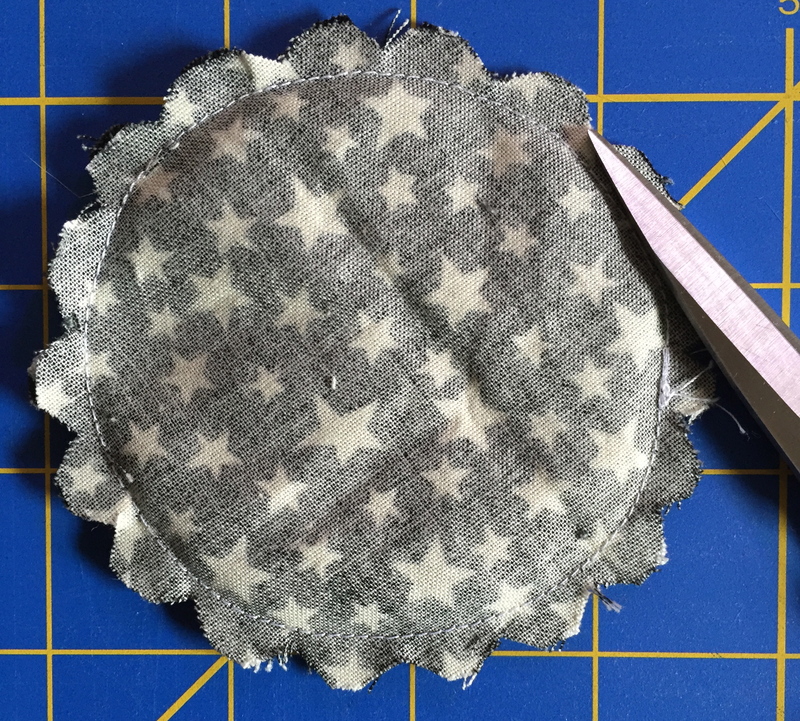 Lay the dresden on a piece of felt for backing and top-stitch 1/8″ in around the points and valleys. Trim the felt close to the points and valleys. 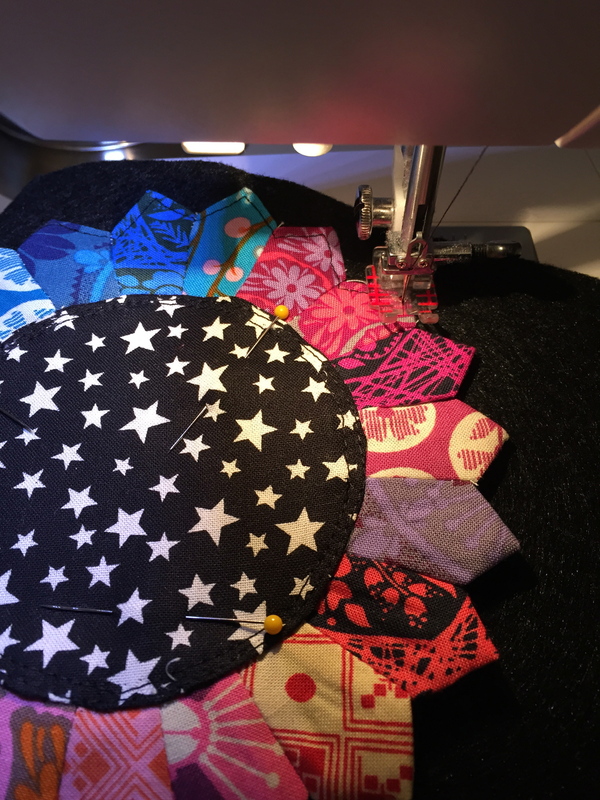 Stitch in the ditch around the circle to fasten more securely to the felt backing. 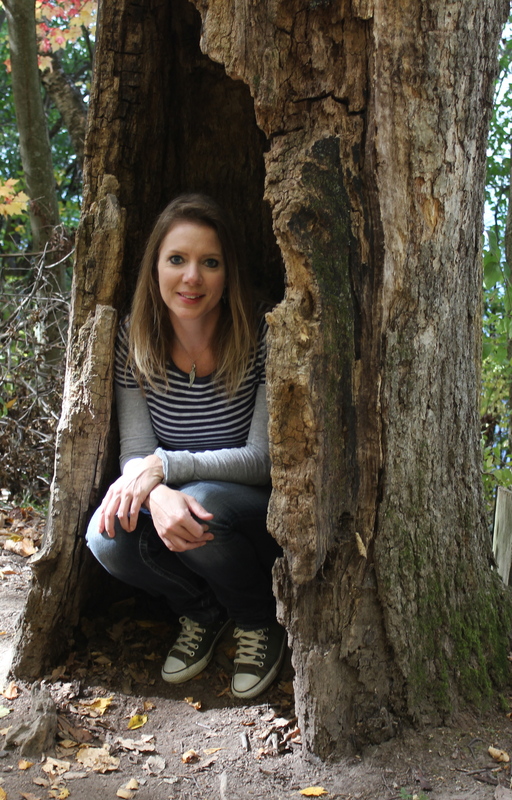 PS – Note: Because I create with human hands, my cutting is never perfect. My sewing is never perfectly straight. My circles aren’t perfectly symmetrical or even. And I always have threads to trim. Please forgive me for that 😉 This is just a fun project I was excited to share. I’m sure there are many ways to make this; I’m just sharing my concept and process here. I try to maintain a relatively short list of unfinished projects. 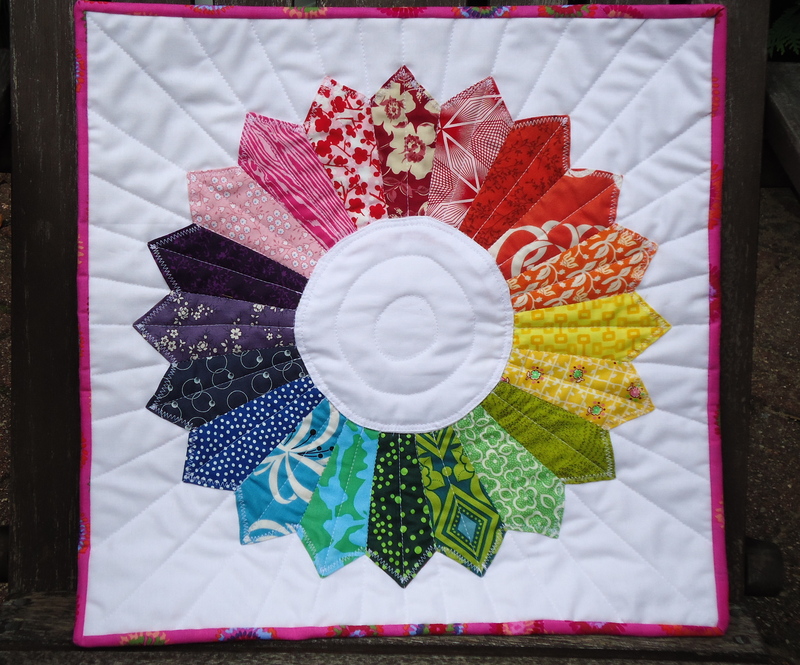 Today, I am happy to show you my most recent finish – my color wheel dresden plate mini quilt! 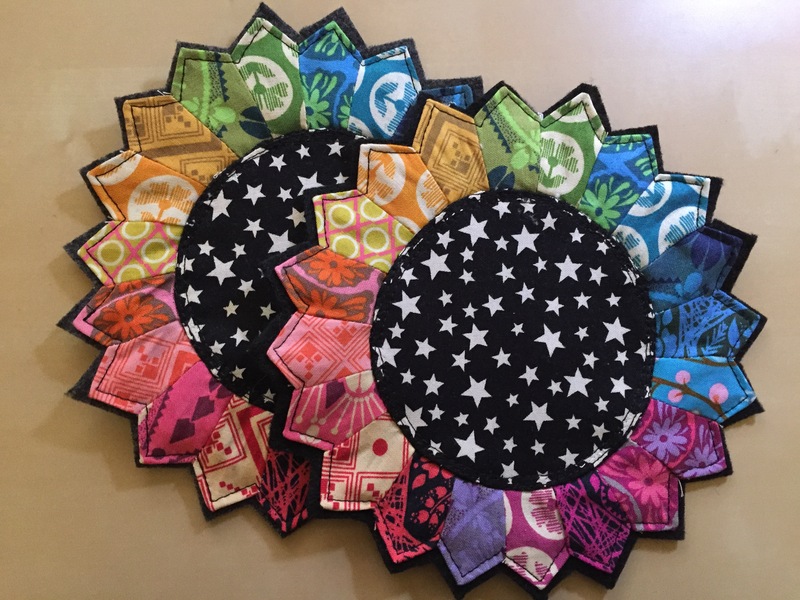 I quilted a few circles in the center, and lines radiating through each dresden to make this dresden plate look like a sun. I just love how it turned out! I used a fabric for the backing that had a rainbow of colors similar to the front. I also used a binding fabric that had circular shapes, similar to the front. I think this is one of my favorite quilt projects, even though it’s only a 16-inch square. It’s going to hang in my sewing room to radiate happiness and inspiration. Right now, my unfinished list is at about seven projects. 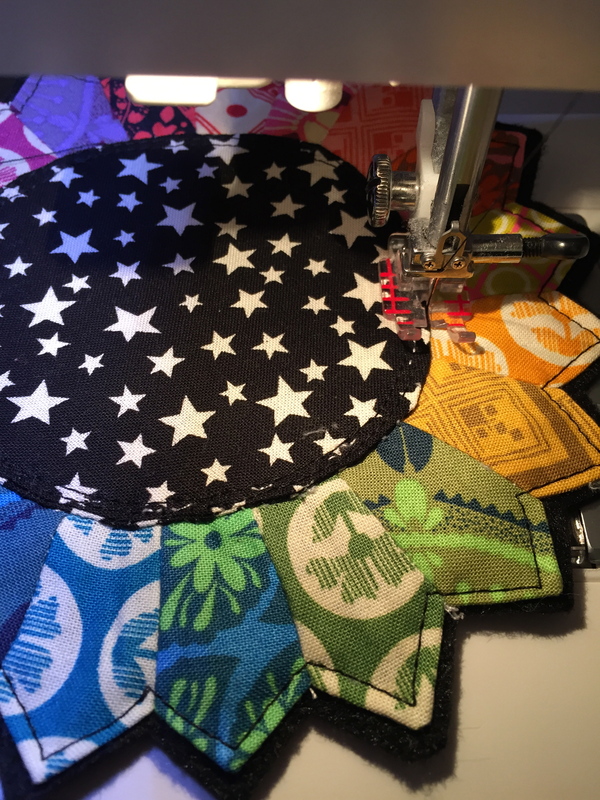 I have three quilts that just need binding, fabrics cut for three quilts that need piecing, and my patchwork blocks from Sew,Mama,Sew’s April Quilting Month II need to be quilted and bound. I’m going on a quilt retreat next weekend with some infamous bloggers (Shelly S, Shelly P, Andrea, Mary, Doris, Amanda, Toni, Rene , Heather and Victoria), so I should be able to make a dent in a few things on my to-do list. 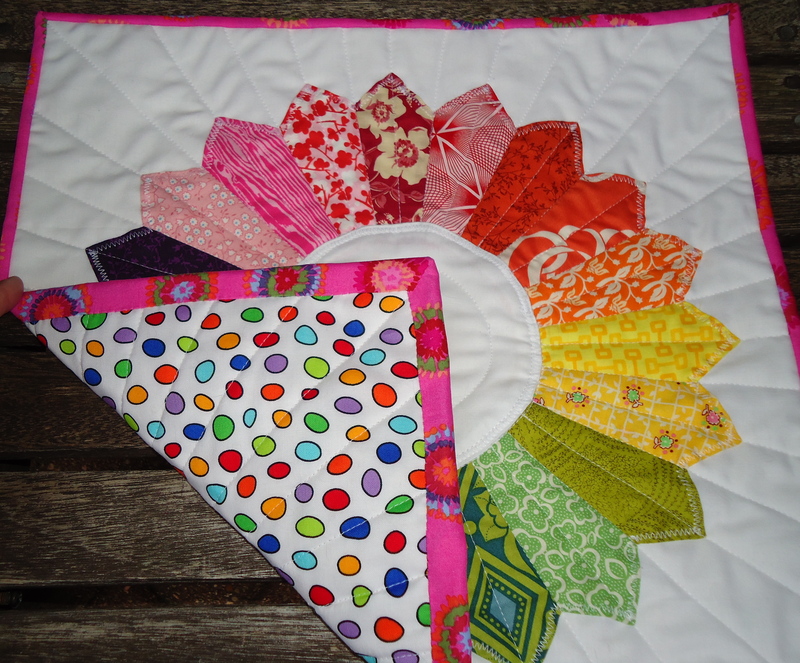 For now, I’m giddy with color wheel happiness!